"Aysberq" Resort Complex all events. Buy tickets for events in "Aysberq" Resort Complex. "Aysberq'" resort complex which is situated in the south-west of Absheron peninsula which has rare and infrequent climate and also is situated in the medicinal land of the Caspian Sea is 12 km distance from the city center. By the accompaniment of the miserable and obscure waves there are beautiful and startling conditions in order to enjoy your resting and memorize unforgettable moments. With its fascinating interior rooms and exterior architecture and amusing structure Aysberq resort comlex can take every person to the world of tales. The hotel consist of 30 rooms that are similar to each other. With the panorama of sea and mountain, King Suite, Suite, Junior Suite, Studio, Standart and Single rooms, thanks to the high level of service Icerberg hotel creates good impressions on people. In order to feel the taste of the four poles of our world we have 200 seater "Titanic", 200 seater "Atlantic" restaurants, 150 seater "Aysberq Bar" restaurant, Breakfast restarunats in which operate professional cookers who gained International Certificates in cooking. With its diversified and numerous conditions and aims, Internet clubs, reading halls, fitness halls, beauty salon, massage salon, sauna and Vitamin Bar are rendered to the use of people. The 700 meters square swimming pool that linked to the "Aysberq" resort complex by the bridge, and another bridge that connects other sides of hotel over the pool are the destinations of your desire. You will never forget your every minute that you spend in this watery and clean place. 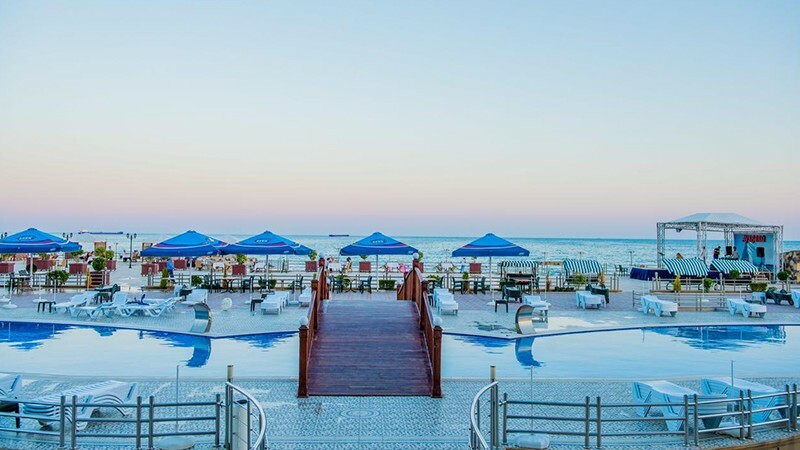 With its wide square, decorative trees, eye-pampering meadows "Aysberq" resort complex creates a good mood furthermore it is the best and quite place to enjoy the blue waves of the Caspian Sea. Encountering with the waves of the sea "Inji" restaurant will contribute you to feel the cool light breeze of the sea. Your corrcet choice is our beautiful convenience.